I had the opportunity to interact with Our Choice, the first book by Push Pop Press. I was too busy blowing, pushing, squeezing to learn anything, truly a mesmerizing experience. This book is a portal into Alice in Wonderland, full of pages folding into dazzling interactive infographics and maps, video and photographs. Push Pop Press will change the way we read books with their interactive app. 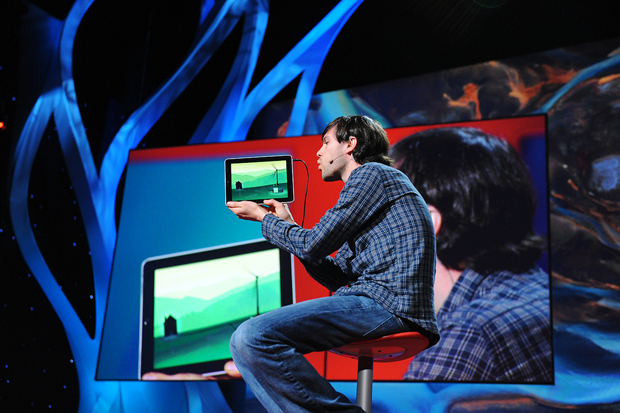 Software developer Mike Matas gives a talk on TED about their first full-length interactive book for the iPad. It works on both the iPhone and the iPad. It sells for $9.99. This entry was posted in Digital, Entertainment, Internet, Media and tagged Al Gore, An Inconvenient Truth. iPad, books, digital, interactive, Our Choice, pop, press, push. Bookmark the permalink.